Do you have refilled cartridges for the HP 5550 Deskjet printer? Yes, we supply premium brand compatible HP Deskjet 5550 ink cartridges which are professionally remanufactured or refilled. Any cartridge listed on this page as "Premium brand" rather than "Genuine HP" has either been refilled or made by a third-party manufacturer as a cheaper alternative to the original HP cartridge. When it comes to first-rate prints, the 550 is extremely hard to outdo. Even though you might be mostly satisfied working with your inkjet printer, any time the printer cartridge dries out you will immediately realise the fact that replacing your drained inkjet cartridges could very well cost you a lot of your cash. Actually getting matching ink is really a cumbersome problem, even more so when it means the need to go to and phone lots of providers. However, getting your hands on your 550 cartridges shouldn't end up being a taxing time. Purchase your HP 550 inkjet cartridges at Cartridge Save and you'll gain more than purely some time, you'll additionally find great deals! Every time you choose to shop for low cost HP inkjet cartridges at Cartridge Save, you can be certain this purchase will likely arrive on the next working day. All HP 550 printer supplies bought at Cartridge Save are also covered with our cash-back guarantee. If perhaps you've hassles, merely send us your ink for a 100 % refund. When there are fantastic bargains such as these you can definitely spend less thanks to Cartridge Save. This sleek device by HP is aimed at home users in need of an affordable and user-friendly printer that can give them excellent print quality. Many users report low quality photos and slow print speeds, though. The HP Deskjet 5550 may not be the best choice if you want a fast printer to handle your documents and photo printing needs. The HP Deskjet 5550 is designed as a home inkjet printer with tech-savvy extras. It weighs 12.8 lbs and is quite bulky, being 15.2 inches in diameter and 18 inches wide. Designed mainly as a personal printer for students, its maximum resolution is at 1200x1200 dpi. It features parallel IEEE 1284 (EEP/ECP) and USB, and it has an optional duplexer. The maximum RAM of the HP Deskjet 5550 is 8MB, and the maximum duty cycle is 3000 pages. 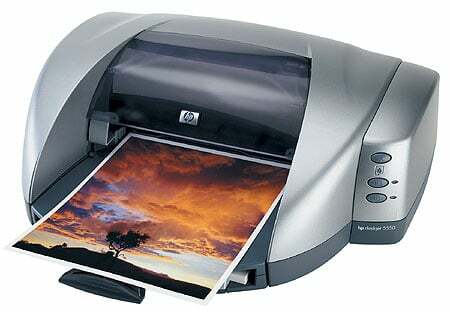 The HP Deskjet 5550 is a budget-friendly printer for personal use, making it ideal for people with basic printing needs. It is user-friendly, too, so it is easy to set-up – just follow the instructions provided. Relatively quiet, this device only emits 40 dB of sound, and is certainly less noisy than other inkjet printers around. In draft mode, the HP Deskjet 5550 can produce 17ppm in monochrome. Unfortunately, the HP Deskjet 5550 is slow when printing colored output. You will really see this sluggishness if you try to print 4x6-inch photos in normal mode at 0.7 ppm. Despite the futuristic design, the HP Deskjet 5550 is rather bulky and may take up a little too much space on your desk. Paper jam is also another common issue with the Deskjet 5550.